Canada Pension Plan Investment Board posted strong investment gains in its fiscal 2017 year as the fund continues to retool its approach to risk and increase the diversity of its investments. CPPIB, the largest pension fund in the country and manager of the Canada Pension Plan’s portfolio, said that buoyant equity markets provided a boost last year that helped the fund reach net investment gains of 11.8 per cent in its fiscal 2017 year, which ended March 31. During that period, total assets climbed to $316.7-billion compared with $278.9-billion at the same time last year. The increase in CPPIB’s assets through the year came from $33.5-billion in net income after all costs and $4.3-billion in net Canada Pension Plan contributions. Mark Machin, chief executive officer of CPPIB, said the fund is still finding plenty of pockets of investment opportunities, even as valuations have climbed in many asset classes outside the public markets. “While infrastructure may be really highly priced, and private equity in the U.S. might be really highly priced, and core real estate might be really highly priced – we have teams and capabilities to find the other opportunities,” he said in a press event to discuss the fund’s results. It has been one year since CPPIB announced the leadership change that Mr. Machin would replace outgoing CEO Mark Wiseman. Since then, the fund has moved to further extend the range of investments the fund makes, both by asset class and geography. CPPIB did 182 global transactions in 2017, a figure that has been climbing in the last few years. Of those transactions, 19 were worth more than $500-million. Mr. Machin said this has been one of the most active years for the fund because investment teams are getting more developed and the investment fund is growing. CPPIB’s thematic investing team, for example, bought a stake in the parent company of river and ocean cruise operator Viking Cruises, while the fund’s private investment team acquired specialty insurance company Ascot Underwriting Holdings Ltd. 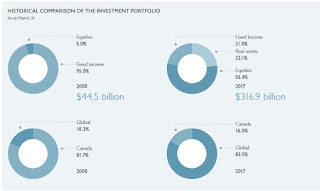 The portion of the fund’s investment activities now taking place outside of the country also continued to tick up in the past year, and 83.5 per cent of the fund’s total assets are now located beyond Canada. Ed Cass, CPPIB’s chief investment strategist, said that diversification in geography and asset class is the “one free lunch in financial markets” that the fund gets. This year, the return profile of private assets lagged public equities, but the fund believes that infrastructure, real estate, private credit and other alternative investment classes will help improve investment results over the long term. Still, CPPIB is highly exposed to Canada, given the country’s overall contributions to the global economy, says Mr. Machin. “But we’re comfortable being massively overweight Canada because it is our home turf and we really understand it,” he said. CPPIB reported a 10-year annualized return of 5.1 per cent after factoring in inflation, which exceeds the standard set by Canada’s Chief Actuary. The CPP Fund, which houses investments for the Canada Pension Plan, rose to $316.7 billion at the end of March on the back of an 11.8-per-cent net annual investment return. The $37.8-billion increase in assets consisted of $33.5 billion in net income after all CPPIB-related costs, and $4.3 billion in net Canada Pension Plan contributions. Despite the double-digit results for fiscal 2017 — which far outstripped a 3.4-per-cent return a year earlier — soaring stock markets caused the investment fund to underperform the 14.9-per-cent return of its benchmark reference portfolio, a passive portfolio of public market indexes. “Given our deliberate choice to build a prudently diversified portfolio beyond just public equities and bonds, we expect to see swings in performance relative to this benchmark, either positive or negative, in any single year,” said Mark Machin, chief executive of the Canada Pension Plan Investment Board, which invests funds not needed to pay current benefits of the Canada Pension Plan. “Over the longer term, the investment portfolio has outperformed the Reference Portfolio over both the past five- and 10-year periods,” Machin said, noting that the investment portfolio is being built to be “resilient during periods of economic stress” and to add value over the long term. Four investment departments completed 182 global transactions in fiscal 2017, which Machin said was among the fund’s busiest years. Nineteen of those investments were more than $500 million. Current stock market volatility and political uncertainty could create opportunities for the fund in the coming year, Machin said, adding that CPPIB continues to hunt for alternative investments such as infrastructure and real estate, despite high prices caused by stiff competition. While being outbid by other investors in many instances, CPPIB has found success in emerging markets and complex situations that draw fewer bidders, he said. But he added that there would be more opportunities in the United States if U.S. policymakers are able to advance their agenda to increase investment in infrastructure. “It’s a bipartisan view that the U.S. needs … more investment in infrastructure,” Machin said, adding that Canada’s largest pension would be interested in everything from roads, to airports, to energy transmission. Machin and CPPIB’s chief investment strategist Ed Cass said they would like to find a way to make more infrastructure investments in Canada, even if it means divesting Canadian stocks or other investments here in order to rebalance the fund’s portfolio. However, details of how such investments would work under the federal government’s new Infrastructure Bank still need to be worked out, they said. Among the challenges is that many of the projects rolled out are expected to be new “greenfield” infrastructure, which carries more risk than the operating assets CPPIB prefers. Officials from the country's largest pension fund said Thursday they'd welcome the opportunity to invest in Canadian infrastructure but there's been a limited supply of suitable assets available to purchase. "If the opportunities were there, we'd love to look at them. We'd love to invest in them. It's just a scarcity of opportunities," said Mark Machin, CEO of the Canada Pension Plan Investment Board. He said the CPPIB is constantly on the hunt for purchases around the world but finds itself frequently outbid by rivals when infrastructure comes on the market. "That's terrific for governments. It's terrific for sellers. But when you're competing to buy, it's really razor-sharp pricing," Machin said. "So we've been quite cautious on where we've added assets." Machin and CPPIB chief investment strategist Ed Cass said they'd prefer to invest in late-stage infrastructure projects or completed projects rather than "green field" developments that need to be approved and built before they generate cash flow. Cass said that the new federal infrastructure bank, which is being created by the Trudeau government, will be able to "package" opportunities for late-stage investors after going through the early stages. But Machin said that CPPIB faces no political pressure to invest in Canada, or the infrastructure bank, because the fund has a clear mandate to maximize investment returns and operates at an arms length from all levels of government. "We're shielded from anything along those lines," Machin said. His comments were made as CPPIB, created in 1999, announced that 2016-17 marked one of its best years for investment returns in a decade. 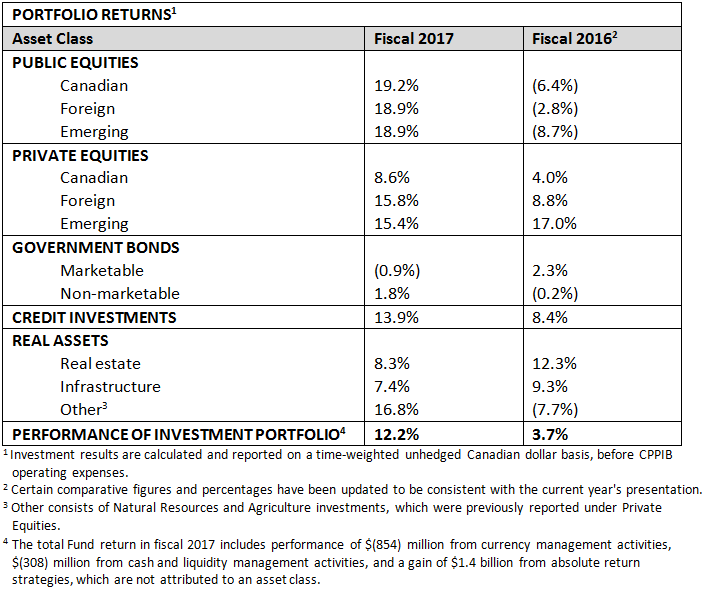 As of March 31, when CPPIB's financial year ends, it had $316.7 billion in assets — up $37.8 billion from a year before through a combination of market gains and new funds. That trails only the $45.5 million increase in 2014-15, the biggest in the past 10 years. For 2016-17, the fund realized a gross return of 12.2 per cent or 11.8 per cent in net return after all costs. For the 10-year period, CPPIB's annualized gross return was 6.7 per cent or 5.1 per cent on a net basis. The Canada Pension Plan Investment Board (CPPIB), one of the world's biggest infrastructure investors, is regularly losing out in bidding wars for such assets, its chief executive said, as investors seek alternatives to low-yielding government bonds. The CPPIB is one of the world's biggest investors in infrastructure such as roads, bridges and tunnels but its CEO Mark Machin said high valuations were making it harder to do deals in the current environment. "We are consistently outbid for assets around the world because they are really priced almost to perfection and there's an enormous amount of capital chasing infrastructure, particularly in developed markets," Machin told reporters after the fund reported results for its last fiscal year on Thursday. The CPPIB did acquire a 33 percent stake in Pacific National, one of the largest providers of rail freight services in Australia, for about A$1.7 billion ($1.3 billion) last year but was generally less active in the infrastructure space than it has been in previous years. Machin said there could be opportunities in the United States if U.S. President Donald Trump proceeds with a $1 trillion infrastructure plan. "If the U.S. comes on stream that would be really interesting because it's such a massive market. There are pools of capital that are getting ready to invest in it. If policy (makers) in the U.S. got their act together that would produce a good home for a lot of capital looking for that type of opportunity," he said. The fund, which manages Canada's national pension fund and invests on behalf of 20 million Canadians, reported a net return of 11.8 percent on its investments last year, helped by its strategy of diversifying across asset classes and geographies. The performance represented a significant improvement on the year before, when the fund achieved a net return of 3.4 percent. The CPPIB said it ended its fiscal year on March 31 with net assets of C$316.7 billion ($232.2 billion), compared with C$278.9 billion a year ago, one of the largest yearly increases in assets since it was created 20 years ago. The CPP Fund ended its fiscal year on March 31, 2017 with net assets of $316.7 billion compared to $278.9 billion at the end of fiscal 2016. The $37.8 billion increase in assets for the year consisted of $33.5 billion in net income after all CPPIB costs and $4.3 billion in net Canada Pension Plan (CPP) contributions. The portfolio delivered a gross investment return of 12.2% for fiscal 2017, or 11.8% net of all costs. In fiscal 2017, CPPIB continued to prudently execute its long-term investment strategy to diversify the CPP Fund across multiple asset classes and geographies. Through four investment departments, the organization completed 182 global transactions. In the 10-year period up to and including fiscal 2017, CPPIB has now contributed $146.1 billion in cumulative net income to the Fund after all CPPIB costs. Since CPPIB’s inception in 1999, it has contributed $194.1 billion. For the five-year period, the net nominal return was 11.8%, contributing $129.6 billion in cumulative net income to the Fund after all CPPIB costs. CPPIB’s 10-year annualized net nominal rate of return of 6.7%, or 5.1% on a net real rate of return basis, was above the Chief Actuary’s assumption over this same period. The real rate of return is reported net of all CPPIB costs to be consistent with the Chief Actuary’s approach. In the most recent triennial review released in September 2016, the Chief Actuary of Canada reaffirmed that, as at December 31, 2015, the CPP remains sustainable at the current contribution rate of 9.9% throughout the forward-looking 75-year period covered by his report. The Chief Actuary’s projections are based on the assumption that the Fund’s prospective real rate of return, which takes into account the impact of inflation, will average 3.9% over 75 years. 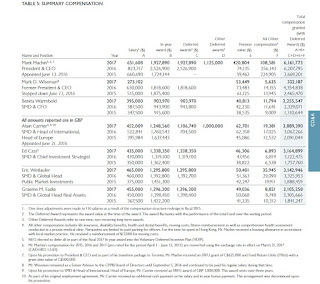 The Chief Actuary’s report also indicates that CPP contributions are expected to exceed annual benefit payments until 2021, after which a small portion of the investment income from CPPIB will be needed to help pay pensions. In addition, the report confirmed that the Fund’s performance was well ahead of projections for the 2013-2015 period as investment income was 248% or $70 billion higher than anticipated. The CPP’s multi-generational funding and liabilities give rise to an exceptionally long investment horizon. To meet long-term investment objectives, CPPIB continues to build a portfolio designed to generate and maximize long-term returns at an appropriate risk level. Accordingly, long-term investment returns are a more appropriate measure of CPPIB’s performance than returns in any given quarter or single fiscal year. CPPIB also measures its performance against a market-based benchmark, the Reference Portfolio, representing a passive portfolio of public market indexes that reflect the level of long-term total risk that we believe is appropriate for the Fund. To provide a clearer view of CPPIB’s performance given our long-term horizon, we track cumulative value-added returns since the April 1, 2006 inception of the benchmark Reference Portfolio. Cumulative value-added over the past 11 years totals $8.9 billion, after all CPPIB costs. In fiscal 2017, the Reference Portfolio’s return of 14.9% outperformed the Investment Portfolio’s net return of 11.8% by 3.1% The Reference Portfolio return was $8.2 billion above the Investment Portfolio’s return, after deducting all costs from the Investment Portfolio and CPPIB’s operations. Over the five- and 10-year periods, the Investment Portfolio continued to outperform the Reference Portfolio by $5.6 billion and $6.7 billion, respectively, after all CPPIB costs. This fiscal year reflected a decline in the operating expense ratio for the second year in a row, as well as a slowdown in the growth of CPPIB’s operating expenses. We are committed to maintaining cost discipline in the years ahead. Approximately 32% of our personnel expenses are denominated in foreign currencies and that percentage is expected to increase in the coming years as we continue to hire specialized talent and skills where most of our investing activities occur. To generate the $33.5 billion of net income from operations after all costs, CPPIB incurred total costs of $2,834 million for fiscal 2017, compared to $2,643 million in total costs for the previous year. CPPIB total costs for fiscal 2017 consisted of $923 million, or 31.3 basis points, of operating expenses; $987 million in management fees and $477 million in performance fees paid to external managers; and $447 million of transaction costs. 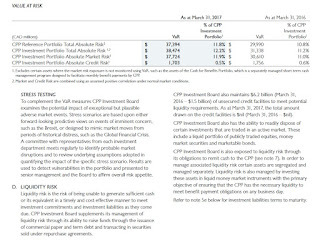 CPPIB reports on these distinct cost categories, as each is materially different in purpose, substance and variability. We report the investment management fees and transaction costs we incur by asset class and report the net investment income our programs generate after deducting these fees and costs. 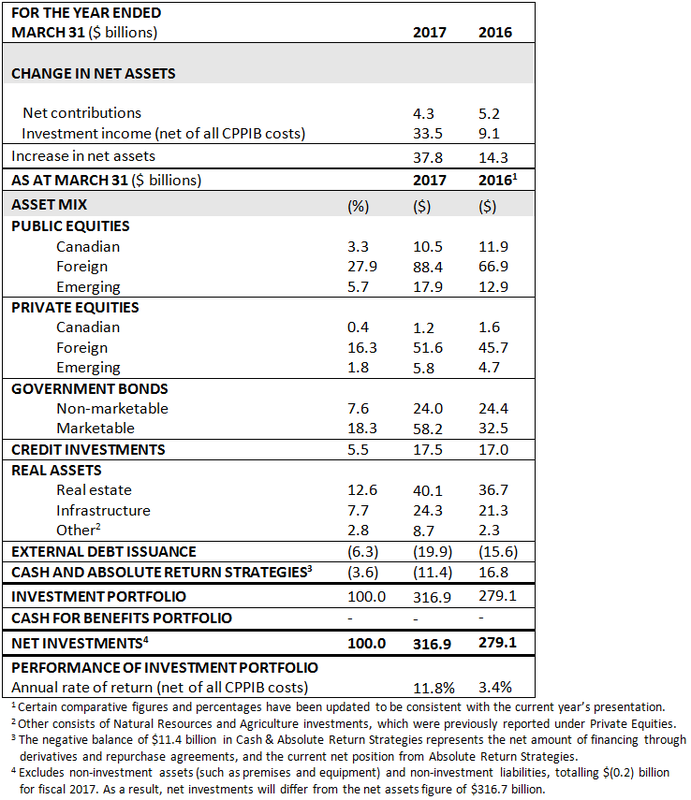 We then report on total Fund performance net of these fees and costs, as well as CPPIB’s overall operating expenses. Investment management fees increased due in part to the continued growth in the level of commitments and the average level of assets with external managers, and the year-over-year growth in the performance fees paid. Notably, performance fees reflect the strong performance of our external managers. Transaction costs marginally increased by $10 million compared to the prior year. This year, we completed 19 global transactions valued at over $500 million, in addition to other transactions assessed across the investment groups. Transaction costs vary from year to year as they are directly correlated to the number, size and complexity of our investing activities in any given period. Portfolio performance by asset class is included in the table below. 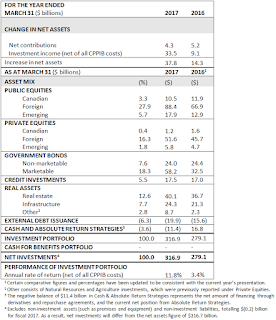 A more detailed breakdown of performance by investment department is included in the CPPIB Annual Report for fiscal 2017, which is available at www.cppib.com. We continued to diversify the portfolio by the return-risk characteristics of various assets and countries during fiscal 2017. Canadian assets represented 16.5% of the portfolio, and totalled $52.2 billion. Assets outside of Canada represented 83.5% of the portfolio, and totalled $264.7 billion. Invested an additional C$400 million for a 1.4% stake in Kotak Mahindra Bank (Kotak). Kotak is a leading private-sector bank holding company in India, with additional lines of business in life insurance, brokerage and asset management. To date, CPPIB has invested a total of C$1.2 billion, representing a 6.3% ownership stake in the company. Invested US$280 million in convertible preferred equity securities of a parent company of Advanced Disposal Services, Inc. (Advanced Disposal), which converted to approximately 20% common equity of Advanced Disposal upon its initial public offering. Based in Ponte Vedra, Florida, Advanced Disposal is the fourth largest solid waste company in the U.S. with operations across 16 states and the Bahamas. Invested A$300 million for a 9.9% ownership in Qube Holdings Limited (Qube), the largest integrated provider of import-export logistics services in Australia. The investment helped fund Qube’s share of the purchase of Asciano Limited, which was acquired by a consortium of global investors including CPPIB. Invested US$137 million in Daesung Industrial Gases Co., Ltd. (Daesung) for an 18% ownership stake, alongside MBK Partners. Headquartered in Seoul, Daesung is the leading industrial gas producer in South Korea servicing a diversified blue-chip customer base with a resilient business model supported by long-term contracts. Acquired a 3.3% direct ownership interest in Bharti Infratel Limited for US$300 million, as part of the purchase of a 10.3% stake alongside funds advised by KKR, from India’s Bharti Airtel Limited. Bharti Infratel deploys, owns and manages telecom towers and communication structures for various mobile operators, and is India’s leading player. Announced a combined investment of US$500 million with TPG Capital for a 17% stake in MISA Investments Limited, the parent company of Viking Cruises. TPG Capital and CPPIB each invested US$250 million to support and accelerate Viking Cruises’ growth initiatives and strengthen the company’s balance sheet. Viking Cruises is a leading provider of worldwide river and ocean cruises, operating more than 60 cruise vessels based in 44 countries. Acquired an approximate 48% stake in GlobalLogic Inc., a global leader in digital product development services, from funds advised by Apax Partners LLP. Based in San Jose, California, GlobalLogic helps clients build innovative digital products to enhance customer engagement, user experience and service capabilities. Acquired 100% of Ascot Underwriting Holdings Ltd. and certain related entities (Ascot), together with Ascot’s management, for a total consideration of US$1.1 billion. Based in London, England, Ascot is a Lloyd’s of London syndicate and a global specialty insurance underwriter with expertise spanning multiple lines of businesses, including property, energy, cargo, casualty and reinsurance. Invested additional equity into Teine Energy Ltd. (Teine) to support Teine’s acquisition of the Southwest Saskatchewan oil-weighted assets of Penn West Petroleum Ltd. for a cash consideration of C$975 million. Since 2010, CPPIB has invested approximately C$1.3 billion in Teine and holds approximately 90% of the company on a fully diluted basis. Acquired three U.S. student housing portfolios for approximately US$1.6 billion through a joint venture entity owned by CPPIB, GIC and The Scion Group LLC (Scion). CPPIB and GIC each own a 45% interest in these portfolios and Scion owns the remaining 10%. The joint venture’s well-diversified US$2.9 billion national portfolio now comprises 48 student housing communities in 36 top-tier university markets, totalling 32,192 beds. Entered into two agreements to invest alongside Ivanhoé Cambridge and LOGOS, an Australian-based real estate logistics specialist, to develop and acquire modern logistics facilities in Singapore and Indonesia. In Singapore, CPPIB will initially commit S$200 million for an approximate 48% stake in the LOGOS Singapore Logistics Venture. CPPIB will also initially commit US$100 million in equity for an approximate 48% stake in LOGOS Indonesia Logistics Venture. Acquired a 50% interest in a portfolio of high-quality office properties in downtown Toronto and Calgary at a gross purchase price of C$1.175 billion from Oxford Properties Group, which will retain the remaining 50% interest. The 4.2-million-square-foot portfolio includes seven office buildings with a broad mix of tenants. The transaction brings the total size of the jointly owned Oxford-CPPIB office portfolio to over 12 million square feet. Acquired a 33% stake in Pacific National for approximately A$1.7 billion, as part of the consortium that acquired Asciano Limited. Pacific National is one of the largest providers of rail freight services in Australia. Signed an agreement alongside Baring Private Equity Asia to acquire all the outstanding shares of, and to privatize, Nord Anglia Education, Inc. (Nord Anglia) for US$4.3 billion, including the repayment of debt. Nord Anglia operates 43 leading private schools globally in 15 countries in China, Europe, Middle East, North America and South East Asia. The transaction is subject to shareholder approval and customary closing conditions. Signed a definitive agreement to acquire Ascend Learning LLC (Ascend), a leading provider of educational content, software and analytics solutions, in partnership with private equity funds managed by Blackstone and Ascend management. The transaction is subject to customary regulatory approvals and customary closing conditions. Formed a strategic investment platform with The Phoenix Mills Limited (PML) to develop, own and operate retail-led mixed-use developments across India. CPPIB will initially own 30% in the platform, known as Island Star Mall Developers Pvt. Ltd., a PML subsidiary, which owns Phoenix MarketCity Bangalore, for an equity investment of approximately C$149 million. CPPIB’s total commitment to the platform is up to approximately C$330 million, which will increase CPPIB’s stake in the platform up to 49%. Signed an agreement to sell CPPIB’s 25% stake in AWAS, a Dublin-based aircraft lessor, to Dubai Aerospace Enterprise. The sale was made alongside Terra Firma. CPPIB had been an investor in AWAS since 2006. Sold CPPIB’s 45% ownership interest in 1221 Avenue of the Americas, a Midtown Manhattan office property. Net proceeds to CPPIB from the sale were approximately US$950 million. CPPIB acquired the ownership interest in 2010. An affiliate of CPPIB Credit Investments Inc. sold a 16% equity stake in Antares Holdings (Antares) to a private investment fund managed by Northleaf Capital Partners (Northleaf). Northleaf and Antares are forming a broader strategic relationship, which will include developing separately managed accounts and other investment solutions designed specifically for Canadian asset managers, institutional investors and private clients. Jackson Tai, appointed in June 2016 as our first non-resident Director, also serves on the boards of various publicly listed companies, including HSBC Holdings PLC, Eli Lilly & Company and MasterCard Incorporated. Ashleigh Everett, appointed in February 2017, who is President, Corporate Secretary and Director of Royal Canadian Securities Limited and has served on a number of publicly listed companies. John Montalbano, appointed in February 2017, also serves on a number of corporate boards, including Canalyst Financial Modeling Corporation, Wize Monkey Inc. and Eupraxia Pharmaceuticals Inc. Signed a Memorandum of Understanding with the National Development and Reform Commission of the People’s Republic of China to offer CPPIB’s expertise in assisting Chinese policy-makers as they address the challenges of China’s aging population, including pension reform and the promotion of investment in the domestic senior care industry by global investors. Related to this agreement, CPPIB launched the Chinese edition of “Fixing the Future: How Canada’s Usually Fractious Governments Worked Together to Rescue the Canada Pension Plan”. 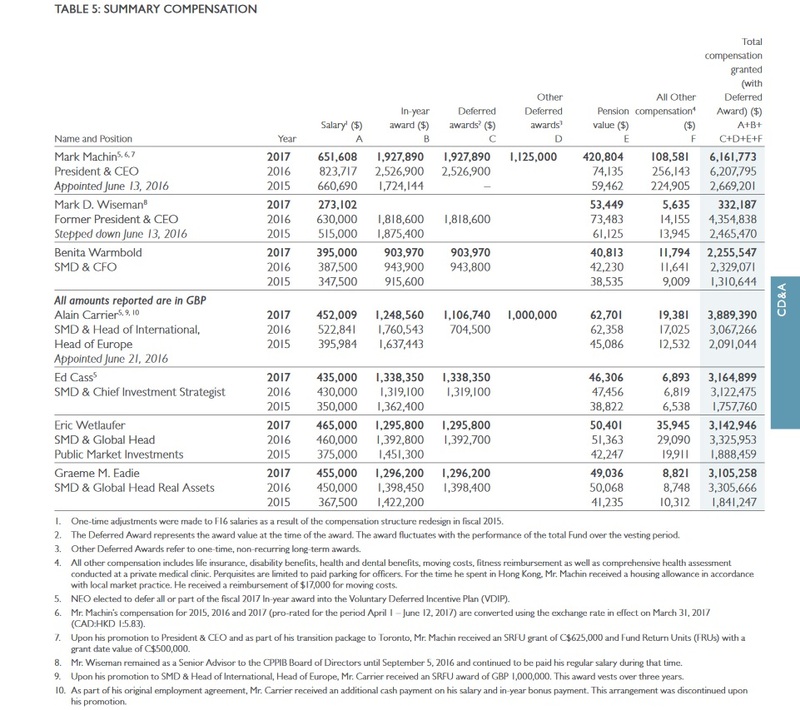 CPPIB Capital Inc. (CPPIB Capital), a wholly owned subsidiary of CPPIB, completed two international debt offerings, comprising three-year term notes totalling US$2 billion, and five-year term notes totalling US$2 billion. CPPIB utilizes a conservative amount of short- and medium-term debt as one of several tools to manage our investment operations. Debt issuance gives CPPIB flexibility to fund investments that may not match our contribution cycle. Net proceeds from the private placement will be used by CPPIB for general corporate purposes. Canada Pension Plan Investment Board (CPPIB) is a professional investment management organization that invests the funds not needed by the Canada Pension Plan (CPP) to pay current benefits on behalf of 20 million contributors and beneficiaries. In order to build a diversified portfolio of CPP assets, CPPIB invests in public equities, private equities, real estate, infrastructure and fixed income instruments. Headquartered in Toronto, with offices in Hong Kong, London, Luxembourg, Mumbai, New York City, São Paulo and Sydney, CPPIB is governed and managed independently of the Canada Pension Plan and at arm's length from governments. At March 31, 2017, the CPP Fund totalled $316.7 billion. For more information about CPPIB, please visit www.cppib.com or follow us on LinkedIn or Twitter. 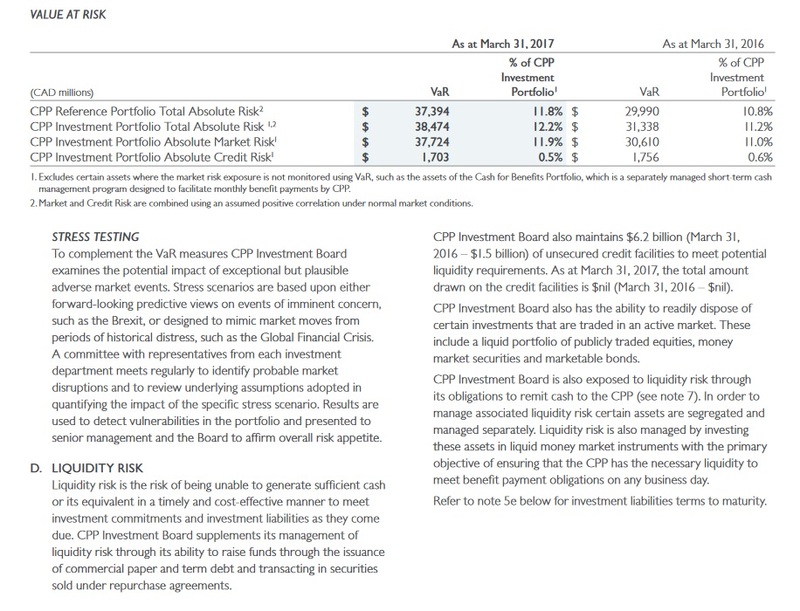 CPPIB also put out its FY 2017 Annual Report which you should read very carefully here. 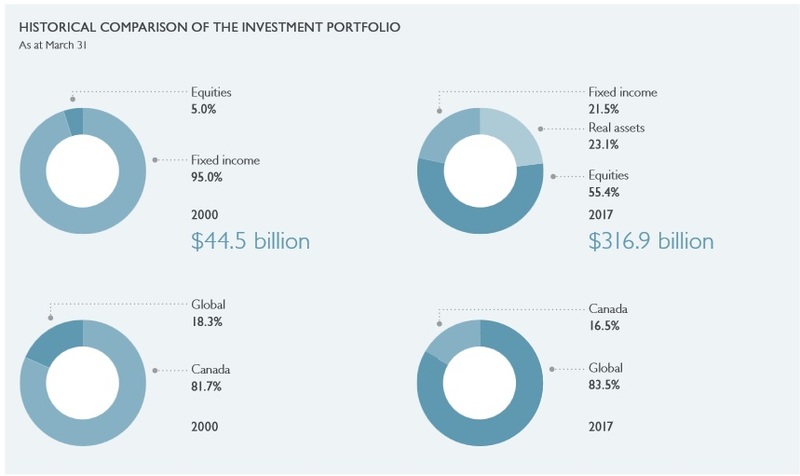 At the very beginning back in 2000, CPPIB's portfolio was almost all Canadian bonds and a tiny bit in Canadian equities and now it's made up of roughly 22% fixed income, 23% real assets, and the rest of it mostly in US and international public and private equities. In order for CPPIB to invest in private markets all over the world, it needs to find the right partners and hire "boots on the ground" to nurture these relationships and to invest directly where warranted (like infrastructure). Based on very long-term projections, the Chief Actuary estimates that contributions will finance 65–70% of future Base CPP benefits. Investment returns will finance 30–35%. In other words, contributions will be almost twice as important as investment returns in sustaining future CPP benefits. Short-term volatility in returns has much less impact on the CPP’s sustainability and minimum required contributions than for conventionally funded plans. A truly long-term perspective can be taken, in which the expected higher returns from undertaking a higher but still prudent investment risk profile tends to increasingly offset the impact of higher short-term volatility as the time horizon lengthens. In fact, it eventually reduces overall risk to the CPP. This shift in the Reference Portfolio makes it that much harder to beat when markets are soaring but over the long term, CPPIB has managed to add considerable value-added with its diversification strategy across public and private markets all over the world. In fiscal 2017, the Reference Portfolio’s return of 14.9% outperformed the Investment Portfolio’s net return of 11.8% by 3.1%. 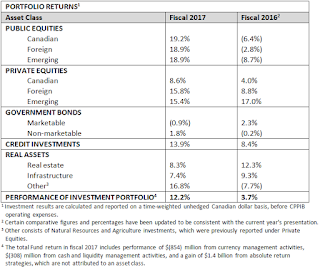 The Reference Portfolio return was $8.2 billion above the Investment Portfolio’s return, after deducting all costs from the Investment Portfolio and CPPIB’s operations. Over the five- and 10-year periods, the Investment Portfolio continued to outperform the Reference Portfolio by $5.6 billion and $6.7 billion, respectively, after all CPPIB costs. 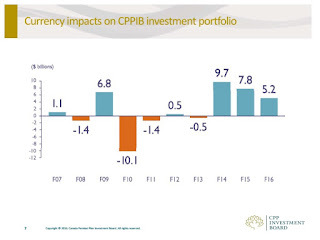 This is why I keep stressing you need to evaluate CPPIB's performance over the last five and ten years, not in any given year. What counts at these large pensions is long-term performance, and here CPPIB has clearly been delivering exceptional results. In terms of results, one thing I would have liked to have seen is an in-depth discussion on performance attribution on currency hedging -- or in the case of CPPIB, non-hedging (CPPIB wisely doesn't hedge currency exposure). We can debate the merits of not hedging F/X risk but we can't debate the fact that on any given year, CPPIB will either enjoy bigger gains from foreign currency exposure or suffer F/X losses if the loonie rallies relative to other currencies (for those that hedge currency risk, it's the exact opposite). Now, as I was writing this comment and got this far late Thursday afternoon, CPPIB's CEO Mark Machin called me to go over the results. He was boarding a plane and didn't have a lot of time to spare so I began by asking him about how currency swings helped boost performance in fiscal 2017. Mark said that while last year currency swings had a material impact on performance, in fiscal 2017, currency swings were "relatively neutral". Mark also told me that the percentage of liquid equities in the portfolio is now 35%, which is another reason why CPPIB will underperform its Reference Portfolio when global stocks are soaring in any given year (78% of the Reference Portfolio is liquid global equities). Basically, VaR estimates how much a set of investments might lose, given normal market conditions, in a set time period such as a day. It is valid under normal market conditions and does not specifically consider losses arising from severe market events. It also assumes that historical market data is a sound basis for estimating potential future losses. Market VaR calculated by CPP Investment Board is estimated using a historical simulation method, evaluated at a 90% confidence level and scaled to a one-year holding period. Under these assumptions, CPPIB can lose 12% in any given year. To complement the VaR measures CPP Investment Board examines the potential impact of exceptional but plausible adverse market events. Stress scenarios are based upon either forward-looking predictive views on events of imminent concern, such as the Brexit, or designed to mimic market moves from periods of historical distress, such as the Global Financial Crisis. A committee with representatives from each investment department meets regularly to identify probable market disruptions and to review underlying assumptions adopted in quantifying the impact of the specific stress scenario. Results are used to detect vulnerabilities in the portfolio and presented to senior management and the Board to affirm overall risk appetite. I think Mark wanted to stress this point because while it's nice to see CPPIB gain 11.8% in fiscal 2017, it's well within the risk forecasts to see the Fund experience a 12% or worse drawdown if markets tumble next year. And as I stressed in a recent comment, CPPIB is preparing for landing, taking a much more defensive approach in its overall portfolio in terms of public and private markets. What else did I discuss with Mark Machin? I told him I saw his former colleague who is now running PSP Investments, André Bourbonnais, on Bloomberg Markets discussing how valuations in private markets are high and how PSP is selling some real estate holdings (see below). Mark agreed, telling me everyone is competing for the same private assets, "outbidding CPPIB", but he prefers to stay disciplined. I asked him where they're finding opportunities and he told me by having the right partners and diversifying geographically, they are able to find some well-priced deals. He added: "If there is a crisis, CPPIB stands ready to capitalize on market dislocations." As you can see, Mark Machin is the highest paid pension CEO in Canada (and the world). But given the level of responsibility he has at the helm of Canada's largest pension fund, and the long-term results CPPIB has delivered, and the fact he left Goldman Sachs a while ago to join CPPIB, I can assure you his total compensation is fair and well within reason for the position he holds. On a personal level, I've only met Mark once in Montreal last Fall and found him to be extremely nice, very sharp and I'm happy he is leading CPPIB now. He also has a very experienced team of senior executives helping him manage assets and risks at CPPIB and very qualified and dedicated employees across the organization. Below, Mark Machin, President and CEO of CPPIB, discusses Home Capital, Trump, NAFTA and more on BNN. You can read the article here and watch the clip on BNN if it doesn't load below. Also, André Bourbonnais, CEO of PSP Investments and the former head of private assets at CPPIB, explains why PSP has chosen London as its European hub, despite the UK's decision to leave the European Union. He speaks on "Bloomberg Markets." See clip below or click here if it doesn't load. Big Departures at Dutch Pension Giants? The $400 Trillion Pension Time Bomb? How To Steal Millions From CalPERS? Ontario Eases Rules For Pension Funding? Ray Dalio Worried About The Big Picture? New Jersey's Big Pension Gamble? Canada's Pensions to the Rescue? PSP Launches a European Growth Hub? Canada's Big Pensions Lean on Bombardier? Ron Mock on Canada's Infrastructure Needs? Can Capitalists Afford a Trumped Recovery? The World According to Ken Griffin? A Caisse of Outrageous Compensation?